For a while I was considering an UV tattoo, than I red in numerous places that those inks are not safe. According to the FDA, "many pigments used in tattoo inks are industrial-grade colors suitable for printers' ink or automobile paint." That shook me... It reminded me of the horror stories of industrial grade silicon that some quack doctors injected into their patients. Maybe it is not as dramatic as that but my brain already made a connection and it was enough to start digging for info. Also UV ink is not entirely invisible until the tattoo heals, and even then it can be visible upon closer inspection. What I also didn't know is that UV tattoos cost more and take longer to be done than traditional tattoos. So I checked, they are about twice the price of regular tattoo in reputable studios ( why go anywhere else) and take about 70% longer to make. Also because UV ink is thinner and harder to work with finding an artist that has a lot of experience with UV tattoos is a must and because of those ink properties, they are much more painful. So, I gave up on this idea! For good! Anyone here thinking about doing it? I would steer clear of UV tats for now. They are getting better and safer each year but they still aren't quite there yet. First off, UV ink is notoriously hard to work with so you would need to find an artist that has experience doing such tattoos and in whose skills you have great faith. Like you mentioned, it is more expensive and time consuming to do them, but more importantly getting one is a big roll of the dice. You don't know how your skin is going to react or how well that tattoo is going to take until after it is already done so you can maybe get more than you bargained for. Also, the way UV inks are right now, the ever present problem of tattoos fading over time goes double for UV tattoos. All those UV issues are clear to anyone that makes them. many parlors are having special notice (on walls, pamphlets etc) so that interested person can be informed. Some of them are even sticking to certain, tested ink label, with given guarantee that will be visible, glowy.. Even estimated duration is there to look upon. Im sure that those 'reputable' shops are having right procedure allways when they separate UV ink aplication from ordinary colors for weeks and special care afterwards. The procentage of those with failed tattoo were allways gathered from those who were impatient to follow long term procedure. let them have it then. And whose gonna convice someone to step off from idea of doing this beautifull art huh? Last Edit: 3 years 1 month ago by Boamund. I don't think you can get a definitive yes or no answer. I guess it's all still debatable. From what I have read here and on the web I wouldn't do them myself. 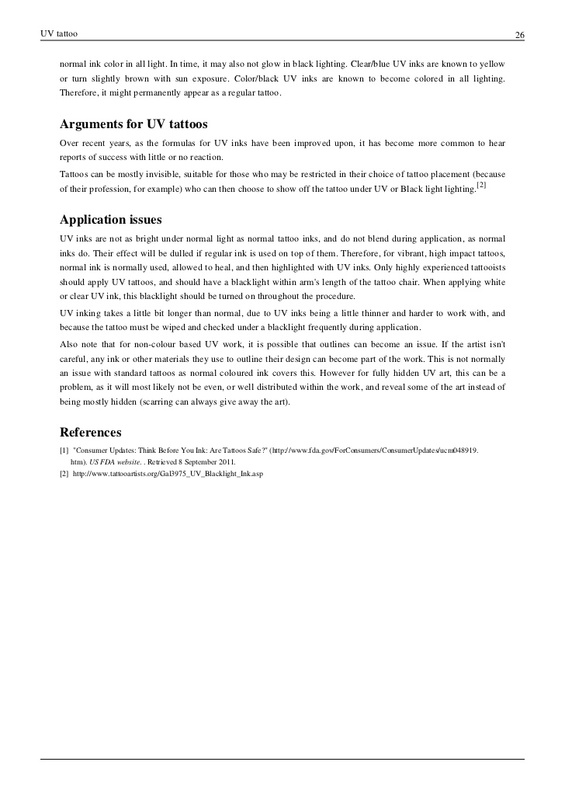 Even if you dismiss all the potential health risks and hypothetically say it's completely safe, the fact that you don't know how exactly a UV tattoo will turn out, for example if it will be truly invisible unless under UV light or if it will be faint but visible even under normal light, is enough to put me off that idea. Thanks for your consideration but I dont need my UV tattoo to be visible other than on party slams. having those radiating colors is beautifull to watch moving while dancing. But that's just the thing, I'm not saying your UV tattoo might be invisible when you want it to be visible (for that you can always get a normal tattoo and just outline it with UV ink) I'm saying the opposite... That a UV tattoo that you want to be invisible and only seen under UV light might actually be faintly visible under normal light. So instead of looking all professional and ink free during the day but having a secret tattoo that only shines through when you're in a club or something, you have a faint but clearly visible tattoo all the time. For some this needn't be a problem, but if you want a UV tattoo specifically for the secrecy aspect this might throw a massive wrench in your plans. DAmn I was so close to do that UV crap few months ago but ex gf stopped me. Its amazing how healthcare industry is blooming and works out solutions in dermatology and in the same time nobody had the breakthrough regarding UV ink. Possibly becouse demand is still not big enough. dunno. I'm no scientist but from what I understand it's not so much that there isn't enough demand or that they aren't working on it extensively it's just that it's hella tricky so the going is slow. 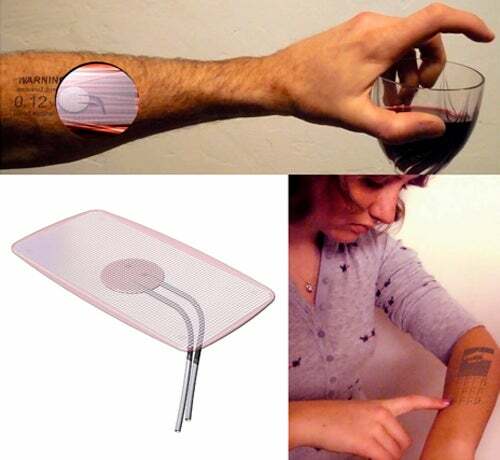 If you ask me, we are more likely to see some digital form of tattoo in the future than a working UV tattoo that can deliver all that it promises without any side effects. If you think having a glowing tattoo is cool, just imagine how awesome it would be if that tattoo was animated and could move, transform or change color! And we havent even touched the safety issue of a tat artist. there are many responsible factors involved. Maybe its too long but its hows exactly what im thinking of.